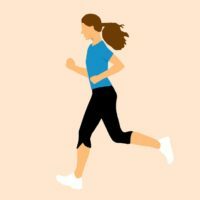 Running to lose weight is a very popular choice for people trying to lose pounds and burn calories. This activity is considered very effective if it’s done right. But there are some things to plan ahead in order to enjoy the full benefits of running to lose weight. If you are planning on running to lose weight, you will need to consider certain things before you dash out the front door! Please check with your physician first so you can set safe limits on your activities. Make sure you know the area where you plan to run. Is it level, or if there are changes in the terrain, you should know where they are, and be familiar with navigating them without tripping and falling. If you plan to jog in the evening, make sure the place you choose to run in is well lit. Keep a check on your hydration level. Remember to bring some water or a sport drink with you, for rehydration. If you know a place with a vending machine, then remember to bring some change! Stretching is extremely important, since it reduces injuries. Make stretching a routine that you do before each run, and you can avoid stiff muscles when you finished running. Make sure you have a pair of good running shoes. Some shoes are designed specifically for running, and those are your best bet. They fit your feet closely, and can feel like they are part of your body. 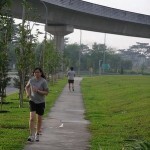 Running is a great way to exercise and lose weight, if done properly. To avoid accidents, keep safety in mind. Start slow, and work your way up. Losing weight doesn’t happen overnight, so give it time. Don’t push yourself too far, expecting miraculous results immediately. Start with a few laps around the track maybe twice a week, then gradually up the frequency in the week. Your joints and muscles will thank you. Just get out and do it! A Simple, Straightforward, Step-by-Step Plan for Fitness and Weight Loss. This program guides you into an active lifestyle with four different exercise schedules. Learn how to set smart goals, eat right, walk or run so you lose the weight forever.Check it out!